bracelet can make that difference. I know that there's a voice in the back of your head saying, I'm not in a survival situation. But, think about it for a moment. What if you get stuck in the snow? What if you get locked out of your house? While these situations may not be the dire straights of Survivorman, these moments can be scary and difficult. Did you know that 92% of people don't plan for emergency situations? You could have a PHd, yet be totally unprepared for those scary moments. Wouldn't a moment or two of proper planning put you in a better situation? The Paracord survival bracelet is a simple way to be prepared. 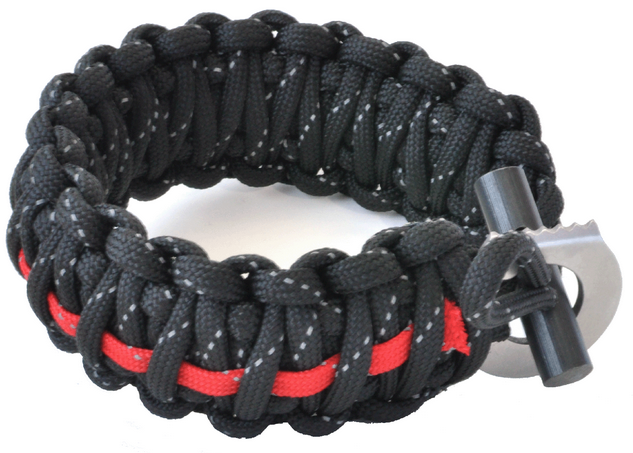 The Paracourd survival bracelet is a 4 in 1 survival bracelet. It offers the following life saving tools. - Fire Starter Rod. Easily create a shower of molten sparks: simply run buckle firmly/quickly against rod. - Starting fires for warmth, food, boiling water, cauterizing wounds, etc.. I've seen a survival bracelet used in some of my favorite survival shows. While I don't see myself as the ultimate survivor, I think that this bracelet is a good idea to keep in the car or carry in my bag. This Paracord bracelet is just $14.95 on Amazon.com. For the cost of lunch, I feel better about any precarious situation. Disclosure: The reviewer received this item. All opinions are her own.